The Akihabara district is located around the Akihabara underground station. 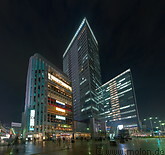 It is famous for the large number of electronics shops found there. In recent years, it has also become a center of the gaming, manga and animation culture. Akihabara originated after WW II as a place where university students would sell ranged out military hardware.